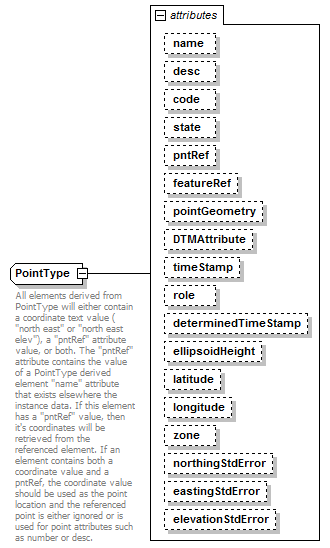 All elements derived from PointType will either contain a coordinate text value ( "north east" or "north east elev"), a "pntRef" attribute value, or both. The "pntRef" attribute contains the value of a PointType derived element "name" attribute that exists elsewhere the instance data. If this element has a "pntRef" value, then it's coordinates will be retrieved from the referenced element. If an element contains both a coordinate value and a pntRef, the coordinate value should be used as the point location and the referenced point is either ignored or is used for point attributes such as number or desc. The featureRef attribute points to a specific named Feature element that contains feature data related to the point. The suggested form is to refer to a feature element within the same CgPoints group or parent element of the point element. <xs:documentation>The featureRef attribute points to a specific named Feature element that contains feature data related to the point.